Fifty years ago, Jeffrey Smith graduated from Mattituck High School. And in the nearly two decades that followed, he served his community as a member of the district’s Board of Education. Want to have a say in Mattituck school district’s future? The Mattituck-Cutchogue School District has scheduled a public meeting to gain feedback on the district’s future goals. Superintendent Anne Smith won’t be leaving the Mattituck-Cutchogue School District anytime soon. At its meeting last Thursday, the Board of Education approved extending Dr. Smith’s contract through July 31, 2019. 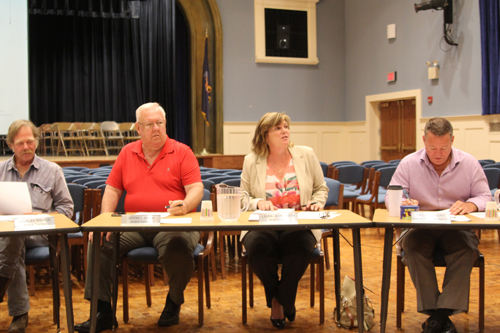 The Mattituck Board of Education may permanently reduce the board’s size to just five seats since some members feel the board has worked well with two less people so far this school year. The Mattituck-Cutchogue school board has decided to fill a vacancy by appointing an interim member to the school board. The Mattituck school board has elected Laura Jens-Smith as its new president and long-time president Jerry Diffley is leaving after serving on the board for 16 years. The Mattituck school board has adopted a $40.2 million budget carrying a 1.73 percent increase to next year’s tax levy. Under the state-mandated tax cap, the district could have presented a budget carrying a 2.4 percent increase in the tax levy without needing 60 percent voter approval. Superintendent Anne Smith said the proposed 2015-16 budget reflects a $159,000 spending increase to maintain current programs and cover a technology infrastructure improvement project, among other expenses. Due to an estimated decrease in pension costs, coupled with an increase in state aid, Dr. Smith said the district plans to complete long-awaited projects like fixing the roof at Laurel Annex. The school board unanimously adopted the budget without discussion at Thursday’s meeting. School board president Jerry Diffley and trustee Jeff Smith were absent. The Mattituck-Cutchogue School District has found itself in an uncommon situation when it comes to preparing its spending plan for next year. Last May, voters approved a $39.6 million budget for the 2014-15 school year. In September, however, that budget was increased to $40,124,885 — without any impact on taxpayers. Many people dried their eyes and asked for tissues at the Mattituck school board meeting Thursday night as the seventh grade boys basketball team explained why a game they didn’t even win last month is an experience they’ll never forget.